Highest quality, natural ingredients offers a weight loss solution that helps you lose weight and keep it off. Slimfy's 3-Stage regimen combines the effectiveness of our scientifically developed formulas. Three progressive stages. Each stage has been formulated to maximize your results as you work towards your ultimate weight loss goals. Stage One kick-starts the weight loss process by introducing your body to the detox and weight loss formula. The next step, Stage Two, will take your weight loss progression to the next level through our enhanced weight loss formula. Stage Three is the maintenance side of our weight loss regimen. This is crucial in achieving and maintaining all the hard work you've put into losing weight. Our formulas include some of the most effective, natural weight loss ingredients in the market: Green Coffee Bean Extract, Raspberry Ketones and African Mango. Chlorogenic Acid found in unroasted green coffee beans, burns fat and increases your metabolism. Slimfy's 3-Stage program triples your metabolic activity and allows your body to metabolize at impressive rates not seen before. Your metabolism affects your size, and the higher your metabolic goes, the more calories and fat you'll burn right off. 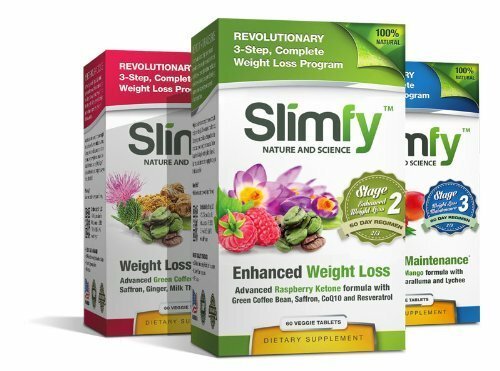 If you have any questions about this product by Slimfy, contact us by completing and submitting the form below. If you are looking for a specif part number, please include it with your message.